Yogurt is a dairy product produced by bacterial fermentation of milk. Fermentation of lactose by the bacteria produces lactic acid, which acts on milk protein to give yogurt its texture and its characteristic tang. Yogurt is considered to be a nutritious snack that is available year-round. Protein, Calcium and Vitamin D in Yogurt play a major role in the prevention and treatment of osteoporosis. It helps to boost immunity due to the presence of friendly bacteria, Lactobacillus casei and bifid bacteria. 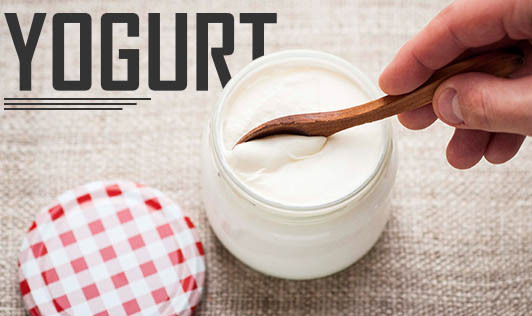 Certain bacteria in the yogurt change the micro flora of the gut and provide protection against ulcers, cancer, irritable bowel syndrome, diarrhea etc. Few studies have shown that regular consumption of low fat yogurt helps to reduce the risk of high blood pressure. Yogurt is known to reduce hunger pangs when eaten as a mid meal snack option. Pieces of fruits are added to it to make it more nutritious and also increase the satiety rating in individuals. Myth: Yogurt will help to populate the "friendly bacteria" that are necessary for good digestion. Fact: In reality, the amounts of cultured bacteria that are in most yogurt products are not enough to do this effectively. In addition to ingesting the good bacteria, they also need a "growth factor", right pH and temperature to help them grow once they get through your stomach. More than 2-3 servings of yogurt daily are essential to repopulate your gut with friendly bacteria. Myth: Yogurt has miraculous properties. Fact: It is true that to eat yogurt is healthy because it contains protein, calcium, vitamins B6, B12 and other compounds necessary for our body to attain the above health benefits. But it is not true that the consumption of yogurt can prolong life or prevent certain types of cancers or cure certain infections like yeast. Top your daily cup of yogurt with a quarter-cup of oats, a handful of nuts, and some berries or dried fruit for a quick, delicious and sustaining breakfast. Yogurts can be used in the preparation of Indian sherbets and smoothies. Substitute yogurt for sour cream or mayonnaise and add your favorite herbs and spices. Yogurt can be used as part of a tangy salad dressing for chicken, tuna or potatoes. Many soups call for yogurt for a creamy texture. Flavored yogurts can simply be consumed as evening snack option.